Measuring of results is no easy business. Specially if you are in the business of social change. However, to me that highlights the need for anyone in this business of social change to constantly monitor why we do what we do, its impact, its costs and the overall sum effect of efforts. Users of public funds for social change in particular need to be greatly mindful of this. However I am not discouraging one from taking risks and making calculated choices to employ the public resources we are entrusted with but it has to be “calculated” and monitored. We can never take for granted the availability of public funds as international development practitioners. Not only because these are tax payer funds but also because we have undertaken to employ them in the best possible way for social change – an unsaid Hippocratic oath of sorts, if you will. So its no surprise that in the environment of austerity measures and economic uncertainty, I have been thinking a great deal about the fundraising approaches that lead to actual funds raised. Not promises, not intentions of support but actual dollar raised. Within that context I have started to look at the communication departments of an organization. They are the drivers of story telling about an organization, cultivators of positive and inspiring imagery, so why can we not associate a dollar amount in part as a measurement of their impact. In a corporate environment marketing and corporate communication activity is expected to yield a Return on Investment (ROI). Its important because companies are in the business of making profit and marketing and PR are components for that. However in the development sector, one is not making profit but is sharing a vision of change that is equal and aims to bring equity and justice in our divided world. At the same time it is also showcasing the niche/special role that “a”/that organization plays and thereby building brand value and trust for its work. This trust in return is measured by the funds raised and commitments of support. Hence the objective of communication department can be connected with fundraising efforts. Of course the measurement of that can be much trickier if the right proxies and indicators are not part of the communication strategy. I have started to realize that perhaps one way is to look at the dollar-raised-for-dollar-spent as part of the communication strategy. Let me elaborate that a bit. If one of the objectives of the communication strategy is to mobilize resources, shouldn’t the “success” of the communication strategy be measured in part by the funds raised. If so, how do we know “what” contributed to the said funds being raised. One way is to incentivize the measurement itself. For every dollar we spend on any strategy we employ in our communication efforts we must be able to raise at least that dollar. I would suggest that a direct measure be that the communication department is at least able to raise what they spend. Is that possible? Perhaps it is, perhaps its not. But to be able to make the case for a particular communication strategy to be funded we need to look at the potential that has to raise funds. I am saying this partly because I have started to notice that “calculated” risks have now given way to just ad-hoc decisions rather than thought out approaches to communication efforts. In the process a complete glossing over the objective of fundraising. How often do we hear from our communication departments on the cost benefit analysis as opposed to “this tool is very popular hence we should use it”. I think communication is a very hard job and somewhat undervalued but communication cannot be about catching on to the latest fad without due analysis of the successes and failures in the context of the objectives. We need a nimble strategy that accounts for adjustments in the process but at the same time also allows for creativity. 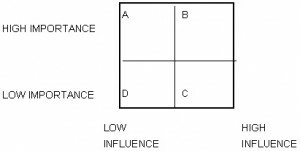 How about a simple importance – influence analysis for each “strategy”.